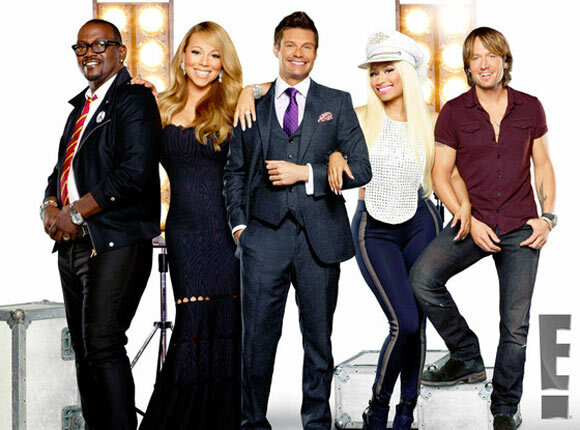 In a new promo photo for Season 12 of FOX’s American Idol, new judges Mariah Carey, Nicki Minaj and Keith Urban, along with longtime judge Randy Jackson featuring host Ryan Seacrest, can be seen all in smiles. The photo published by E! comes a day after the dates of the season premiere was announced on the official website for American Idol. According to American Idol, the two-night premiere of Season 12 is set to start on Wednesday, January 16 (8:00-10:00 PM ET/PT) and Thursday, January 17 (8:00-9:00 PM ET/PT). Ever since the so-called feud between Mariah Carey and Nicki Minaj took place where footage showed Nicki Minaj going off on Mariah and reportedly threatening the singer, as reported on MusiqQueen.com, everyone is wondering what should they expect from the upcoming season of the 12 year running reality talent competition which first broadcasted back in 2002. Will Amercian Idol turn into a drama filled reality show or, as some speculate, was all just to get people to tune in and anticipate the new season of American Idol?